The Atlanta Falcons 2018 season was somewhat of a roller-coaster, with many highs, and even more lows. The beginning of their season would end up providing a glimpse at how the entire year would play out, as they lost heartbreakers to the Eagles, Saints, and Bengals in the first 4 weeks, squeaking by the Panthers to start the campaign 1-3. Only 14% of teams that end the first quarter of the season 1-3 have made the playoffs since 1990, so Atlanta knew the odds were against them and they would have to turn things around. After getting blown out by the Steelers, Matt Ryan and the Falcons seemed to turn things around, winning their next 3 games in a row to get back to 4-4. That 3-game winning streak would be a sign of things to come, as the Falcons were immediately mired in another streak, only this time it was a crushing 5-game losing streak that knocked them out of playoff contention. How could a team with as much talent as Atlanta struggle so mightily? After losing offensive coordinator Kyle Shanahan in 2016, Atlanta really struggled to find its identity on offense in 2017, with the for-some-reason highly touted Steve Sarkisian unable to emulate the success Shanahan had, and it showed with the Falcons dropping from scoring 33.8 points per game in 2016, all the way down to 22.1 in Sarkisian’s first year. They did improve slightly on that number this season, scoring 25.9 points per game, but there were many head-scratching play calls, primarily in the red zone, that killed Atlanta’s hopes of winning many games. It took Julio Jones, a top 3 receiver, and arguably the most talented and physically gifted player in the league, 8 weeks to score his first touchdown of the season, which is a travesty. Sarkisian demonstrated why he should have been fired over and over when the Falcons would get all the way to the red zone, only to run extremely questionable plays and get shut down repeatedly to start the year. Sarkisian was eventually fired the day after the season ended. 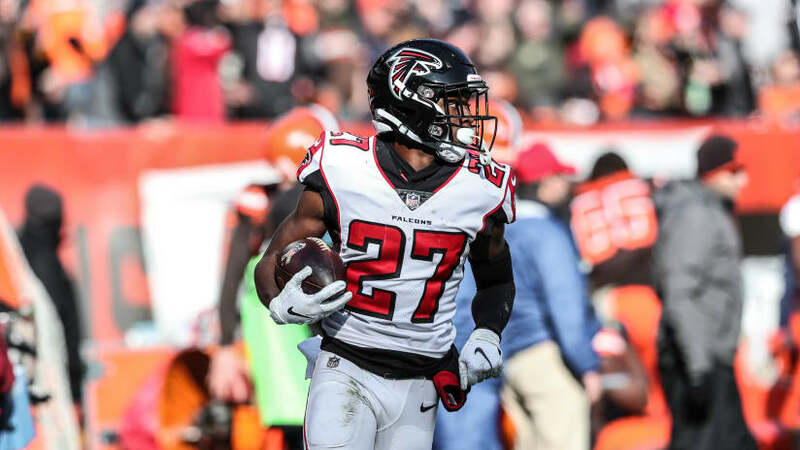 Damontae Kazee led the NFL with 7 interceptions in just his second NFL season and should be a big factor for the Falcons defense for years to come. Although it was, as a whole, a disappointing year for the Falcons, there were many bright spots and Atlanta fans should be ecstatic for next season. Matt Ryan had the second best year of his career, putting up numbers that closely resembled his MVP season in 2016, and proving wrong the doubters who thought he would never get back to his previous form. Calvin Ridley proved to be a steal as the 26th overall pick in last year’s draft, as he was clearly the most productive rookie wide receiver in the NFL this year, hauling in 64 receptions and a team-leading 10 touchdowns. He and Julio Jones, along with Mohammed Sanu, combined to be one of the scariest receiving corps in the league and should continue to do so for many more years, assuming Julio sticks with Atlanta. Lastly, Damontae Kazee, a little-known nickel back turned Free Safety drafted in the 5th round of 2017, surprised the NFL by having 82 tackles and tying for the league lead in interceptions with 7. The kid has a great knack for the ball, and Dan Quinn is thrilled to have him as a force in the backfield. All in all, it was not as successful a season as they wanted in Atlanta, though the future looks very bright if the coaching staff can get their stuff together in 2019 and beyond. A lot will ride on who they bring in to replace Sarkisian as offensive coordinator, and if Dan Quinn can handle the dual responsibility of being a head coach and defensive coordinator next year, which the team recently announced he will be doing. 2018 should turn out to be a valuable stepping stone for this Falcons franchise. This entry was posted in NFL and tagged #NFL, Atlanta Falcons, Calvin Ridley, Damontae Kazee, Dan Quinn, Football, Julio Jones, Matt Ryan, NFL News, nfl recap, Steve Sarkisian on January 7, 2019 by David Lehr.